Blurb: Lucille Howard is getting on in years, but she stays busy. Thanks to the inspiration of her dearly departed friend Arthur Truluv, she has begun to teach baking classes, sharing the secrets to her delicious classic Southern yellow cake, the perfect pinwheel cookies, and other sweet essentials. Her classes have become so popular that she’s hired Iris, a new resident of Mason, Missouri, as an assistant. Iris doesn’t know how to bake but she needs to keep her mind off a big decision she sorely regrets. 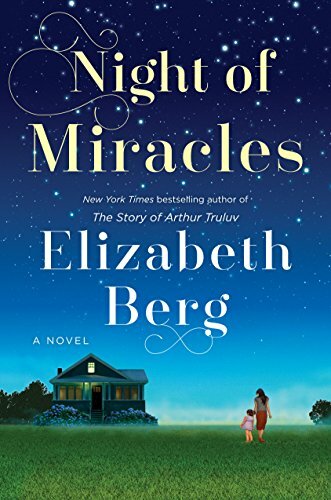 When I started Night of Miracles, the sequel to last year’s The Story of Arthur Truluv (you can read my review here), I was more than a little disappointed that Elizabeth Berg had chosen Lucille Howard as the main character rather than Maddy Harris, since I loved Maddy and wanted to see what had happened in her life in the intervening years. However, I should known that Berg had a plan because the resulting novel is beautiful as well as a beautifully written and makes the reader wish the story never had to end. One of the threads that made The Story of Arthur Truluv such a wonderful novel was the appreciation of ages, Arthur, the old man, could befriend Maddy, the floundering teenager, and they with, Lucille, became a family. The same happens in Night of Miracles to a different degree. The young boy next door, Lincoln, finds a friend in Lucille who introduces him to new games like building a house from cards and new foods, delicious desserts that contain sugar. Kindness is an attractive quality. Women are attracted to overweight Tiny because they see that he is a good person while his petty friend doesn’t understand that kindness, niceness, is important. Failed relationships are almost always a 50/50 deal, it just takes both people being big enough to admit it. Just because you can do things in a new and quicker way, doesn’t mean you have to. Love and friendship can be found anywhere. And, marriage, like all relationships, takes work. Much of the writing in Night of Miracles is like a meditation, the words flowing so beautifully that you are transported to a gentler, softer realm where kindness does win. I suppose that you can read Night of Miracles without reading The Story of Arthur Truluv, but a lot of the heart of Night of Miracles begins in the first novel. If you are in need of a two feel-good stories, I highly recommend reading both of these. Irish Crown Blog Tour with Giveaway! The Vampire King’s Mate with Excerpt and Giveaway! If you want to treat yourself to something special, I think it would be these two books. Very heartwarming stuff and so, so very well written. Thank you. I’m looking forward to getting these.